This offbeat and exquisite blog reader letter came from Lithuania, a country from which I don't receive mail too often. I wish I had taken a photo of the letter, because the sender has excellent and interesting typewriter-like handwriting, and she drew a couple of illustrations on the letter as well. 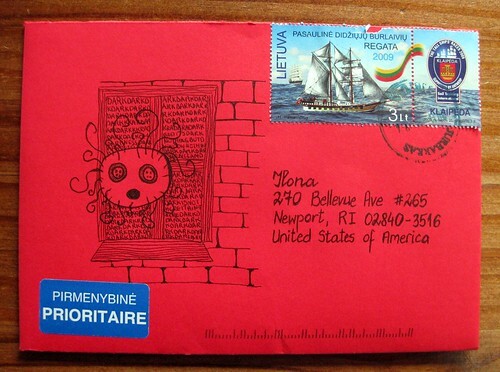 This artwork on the envelope was the most detailed and eye-catching. 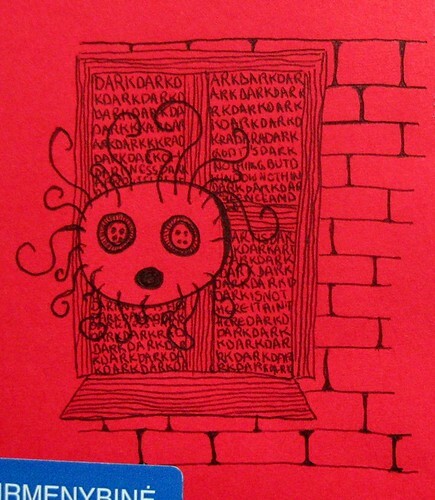 Can you tell that the background in the window is "dark" repeated many, many times? I like that use of words as texture in the drawing. 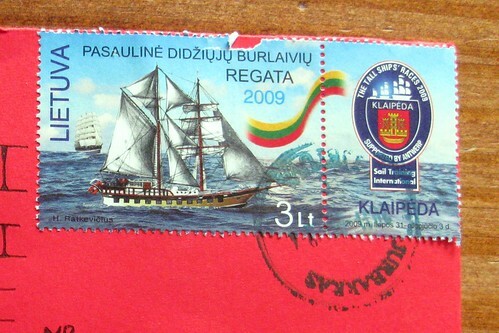 And here's a closer look at that Tall Ships stamp. I really appreciate that the sender included the continued panel next to it, for the full picture! What lovely postage, and other than a tiny rip at the top, it survived the journey well. I love this envelope. whoever this was put alot of thought in to this! LOVE IT! You get some lovely art work that is a stunning envelope. Woo, that's gorgeous! And what a beautiful stamp! !